The new Godley Head battery was the largest defence work undertaken in the South Island since the building of Fort Jervois, some 54 years earlier. The design was a direct copy of those used at the Motutapu and Palmer Head batteries. The new Godley Head battery’s primary purpose was counter bombardment with a secondary one of supporting the examination battery at Battery Point. Counter bombardment is the use of long range gunnery to counter enemy vessels attempting to bombard a coast. A significant aspect of the new long-range gunnery employed at the Battery was that as the shells neared their target, they plunged down at a nearly vertical angle. Previous Victorian and Edwardian battery design did not have to contend with this type of fire. Extensive overhead cover was provided for the guns, magazines, fire control and command areas. The guns with their associated fire control and command systems were regarded as the height of coastal defence establishments. Although the gun emplacements and magazines aligned along the cliff edge were the principal feature of the battery, there were a number of supporting defence structures. These included Battery Observation Posts, Radar Stations, 2 searchlight emplacements and the Battery Plotting Room and Miniature Range. Because Godley was such an important battery and camp, further protection was provided by a range of defensive positions and lookouts. These included the traditional pillboxes as well as some slit trenches which are relatively rare in New Zealand. Strong points (small concrete shelters) were also built on the hill above potential landing sites. Godley followed the trend in British battery design to separate the equipment into different buildings or chambers. This minimised potential damage to the battery by bombardment, and was enabled by the increased reliability and performance of communication equipment. An engine room containing a diesel engine and generators was provided to supply power to the fighting establishment. These structures were connected for communications and power by armoured cables in shallow trenches. 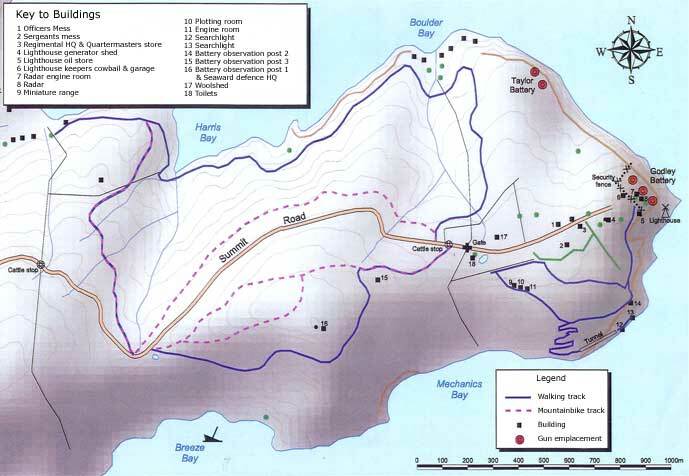 A supporting camp was established 400 meters behind the Godley Head battery. Water supply for this camp posed a major problem as despite sinking several bores, no natural source could be found on the Head. A supply was eventually obtained from the Sumner Borough Council’s reservoir at Taylor’s Mistake. To ensure an adequate supply to the battery area, a 455,000 litre reservoir was established at Black Rock, and a 136,500 litre one at Lyons Main. A simple sewerage system devoid of septic tanks or settling ponds was established for the camp. Its outflow, in common with the water drainage system, was simply discharged over the cliff. The mains electrical supply for the camp was provided by extending the Sumner Borough Council’s grid 3 kilometres and building a small transformer substation at the Head. The camp was extensive. It provided barrack blocks, officers' quarters and houses for senior ranks as well as married quarters. There were ablution and latrine blocks, kitchen facilities, mess, recreation and store buildings, offices and garages. It was intended that the original accommodation for the battery be of permanent materials. Three buildings were built of concrete, the Officers' mess, the Sergeants' mess, and the regimental headquarters and quartermaster's store. The outbreak of war meant that the remaining barracks and facilities were constructed in wood. The influx of WAAC (Women’s Auxiliary Army Corp) personnel and fortress troops required many additional buildings to also be constructed in wood. With the exception of the medical inspection building, which now acts as a caretakers cottage, the timber structures were later relocated for use elsewhere. It is only their foundations which remain alongside the surviving concrete buildings,to provide evidence of the camp's extent. The Battery maintained its operational role as a counter-bombardment Battery until 1200 hours, 2nd of November 1943, when, with the exception of the radar, the Battery passed in to a care and maintenance phase. Though the guns could theoretically be brought into operation within 10 minutes, the absence of full manning would probably have precluded this.